Patinated and polished bronze. High square marble pedestal with beveled edges. 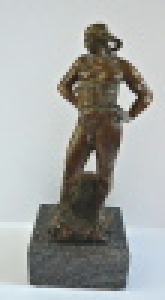 Standing figure of a young naked man with a wide belt, his hands on his waist, head turn a hair braided in two braids. Standing on a rock at the back with mascaron. Signed down monogram L. S. last century. Height 38 cm, width 15 cm.